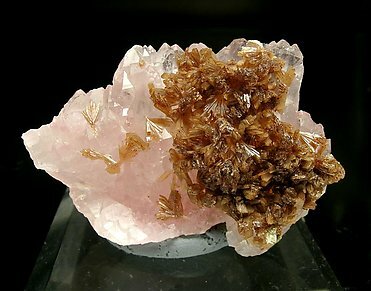 A dense growth of prismatic crystals forming fan groups. Color is very intense. 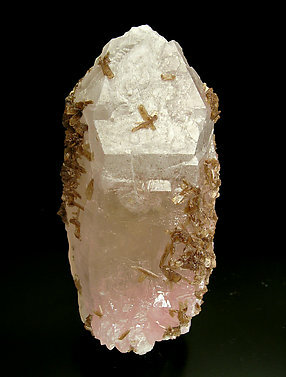 The base is a group of pink crystals of Quartz. A real Brazilian "old timer" (collected in the year 1975), the piece is notable for its aerial growth. 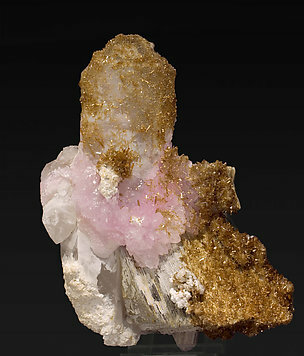 On a leafy aggregate of very well defined crystals of Muscovite and flattened white crystals of Quartz, there is a group of pink crystals of Quartz of intense color and luster, all this partially coated by small crystals of Eosphorite, most of them doubly terminated, transparent, bright and with a deep color.